Banjul is the second largest city in and capital of Gambia. The city is on an island, which has constrained its size - population is only 40,000. Consequently much of the population now is based on the mainland between the airport and the city. The main tourist and business centres are around Bakau, Fajara, Kotu and Serrekunda. 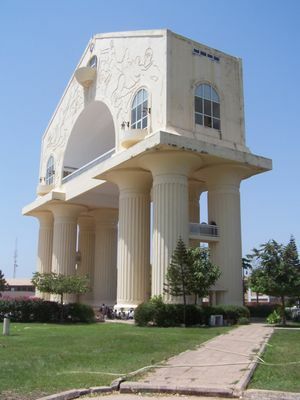 Banjul has become very popular as a package holiday destination with British and other European visitors. Travel company 'The Gambia Experience' has been the market leader, but other operators are increasing their offerings too. Banjul International Airport also known as Yundum International (IATA: BJL, ICAO: GBYD) is the international airport of Banjul. There are many direct flights to Banjul from some parts of Europe and Africa. Direct flights to Conakry, Dakar, Freetown, Amsterdam, Lagos, Brussels, Bissau, London, Accra, Abidjan, Madrid, Barcelona etc. For the intrepid tourist, the Plymouth - Banjul Challenge  ends here as well. Take a Sept-Place, a minivan or a bus to the border to Gambia. From the station you have to walk around one kilometer to the border officials. If you don't want to walk you can take a motorcycle or a donkey for a few cefa. after you passed the Senegalese and the Gambian border officials, you can take a shared taxi or minivan to Barra, cost around 30 Dalasi. From Barra take the Ferry to Banjul, for 25 Dalasi. The ferry takes around one hour. If you are coming from the Casamance region, you can take a Sept-Place to Banjul. Most hotels will have a selection of green taxis, which have fixed prices to the most popular destinations. Bicycles are also available for rental. Car hire is available from Avis and AB, both of which are based at the SeneGambia Hotel. Car hire will cost about 1500 Dalasi/day for a small car. There are buses, minivans and shared taxis going around Banjul and especially to other places in Gambia. shared taxis within Banjul will usually cost you 8 Dalasi. The African Heritage Museum or African Heritage Centre is a museum and art gallery in Banjul, The Gambia. It holds a large collection of African art and statues. The city has two cathedrals and several major mosques. Go to its wonderful beaches. You can find several local budget options on the independence drive. Radio Sud Beach bar. This used to be a radio station which started life as a pirate radio on a boat off Sweden. After changes in the law there, it was sailed away and ended up in the Gambia. The ship and radio station have both now gone (the former sank nearby and the latter closed in 2002 when its mast collapsed). It is now a beach bar and restaurant. The original owners are still there and are happy to talk about the history. 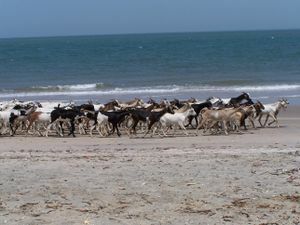 Located on the beach near Banjul city. Driving away from Banjul city it is on the right after the cemetery. There are many restaurants in the road leading to the hotels at Kololi beach. This road is also known as the Senegambia Strip. Unfortunately this area is full with tourists, so be prepared for Bumpsters, super high tourist prices and old beer. Would not recommend eating there. Carlton Hotel on the independence drive is a decent option. Double room with A/C 650 Dalasi for two people. 600 Dalasi for single room. 550 Dalasi for Double room without A/C or fan. Without Internet. Many shops around, also some budget restaurants . Corinthia Atlantic Hotel. North of Banjul city centre on the beach. This is not in the main tourist area, which is further to the West. One of the better hotels with a pool and private beach. Wireless Internet throughout. SeneGambia Hotel. Good beach hotel, which is popular with older travellers. There is no wireless internet, just 2 machines in reception, for which you can buy 1 hour cards at 100 Dalasi. 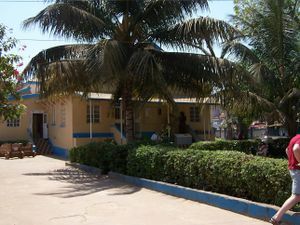 'The Gambia Experience' is based here. Kololi Beach Club. Luxury accommodation. Has time share and soon accommodation for outright purchase. Refuse to give money to children and to mentally ill people. Don't tell anyone where you are staying. In General Gambia is a relatively safe country,the biggest danger are bumpsters who want to rip you off. This page was last edited on 19 March 2017, at 13:14.